In a Few Good Men, Col Jessup’s Code Red was exposed given the implicit contradiction in his two orders. In the case of Derrick Rose, his two guaranteed contracts [totaling $355 million] contradict the most legitimate reason for a player to sit when coming off an injury; the risk of re-aggravating the injury in such a way as to hurt their future earning potential. It would not be an exaggeration to say that no player has ever had less of a case to sit for that reason than Derrick Rose. As a Miami Heat fan, the circumstances surrounding Rose’s refusal to play–teammates playing through their own injuries and illnesses have highlighted the fact that Rose might the healthiest Bull left on the roster–only adds to our magical year. How? By damaging the psyche of a key opponent for years to come. His daily refusal to play is the equivalent of tossing up an air ball at the buzzer, for 6 consecutive weeks. Which is why this Heat fan is rooting for the Chicago Bulls in game 7 vs the Nets tonight. 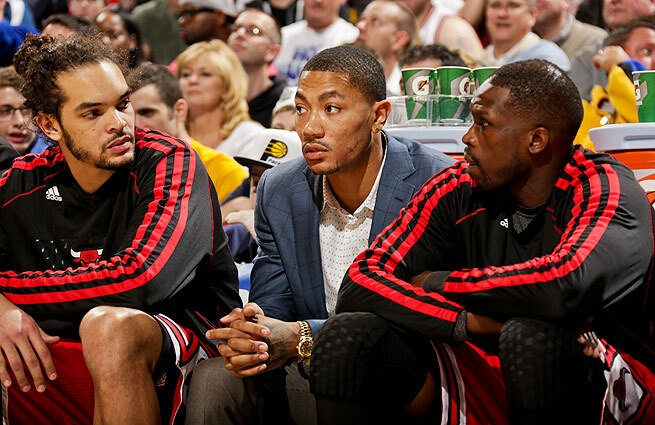 Because if Rose sits through the Heat series, he will be more damaged than Leonard Lowe running low on L-Dopa on a weekend pass. For Bulls opponents, it will be the equivalent of having yearly unprotected draft picks from any organization which allows Michael Jordan to have influence over their personnel decisions. How to describe … it’s like if I hated the Knicks and saw their squad littered with selfish thug-like clowns … oh, wait…. May 2013 – Et II Scottie Pippen? Col Jessup: What do you mean he won’t play? This entry was posted in Sports and tagged A Few Good Men, Awakenings, Col Jessup, L-Dopa, Leonard Lowe, NBA. Bookmark the permalink.